With the unveiling of the completely revamped X Series of electric guitars, Cort introduces the flagship X500 model, a neck-thru-body guitar fully packed with high-end features. The X500 is designed to be heard and seen, balancing a powerful tone that slices through a mix and a cutting-edge esthetic that captures the latest market trends. Although it is supremely built for the aggressive metal styles, the X500 is also versatile enough for many other genres of music. The X500’s high-quality features start with the distinct grain patterns on the Swamp Ash body wing, which is lightweight but has a surprisingly strong, tight and punchy sound with emphasis on the high-midrange. The neck-thru-body construction also helps to sustain and focus midrange punch and cut, and provides rock-solid stability for speed across the entire range of the sleek ebony fingerboard. The 5pc Maple and Panga Panga neck provides stability and a smooth surface for high-speed riffing and soloing with unfettered access to the highest frets. Playability is further enhanced with this model’s distinct “U”-shaped neck and compound radius fretboard. When it comes time for soloing, the X500’s EMG® pickups combine for high and powerful tone, using ceramic magnets that ensure every note is heard. At the neck, the EMG 60 provides full-treble response and ample output for distinct single-note solos. The resulting tone has both clarity and character. At the bridge, the revolutionary 81 uses aperture coils to deliver tone that was designed with detailed intensity, incredible amounts of high-end cut and fluid sustain. Despite its sophistication, the X500 still has the simplicity that a player needs to get the musical point across. The combination of one volume pot and one tone pot with 3-pickup selector keeps it clean and simple, and allows the player to focus on the music. To that point, the Floyd Rose® Special Tremolo system eliminates tuning worries and gives players extra confidence to express musical ideas, whether they’re dive-bombing, doing extreme harmonic squeal pull-ups or providing subtle chordal coloration. 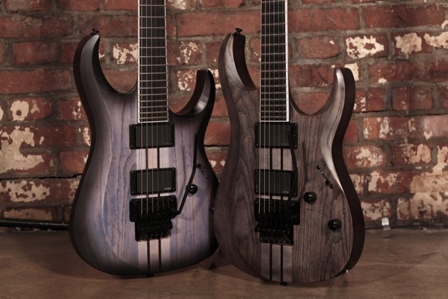 The X500 is available in two natural finishes: Open Pore Trans Grey and Open Pore Jean Burst. White binding on the fingerboard, black hardware and die-cast tuners complete the edgy esthetic.